Jeff Brady has reached the most difficult portion of the roof slat installation, the corners. At the corners there is little space remaining to bend and nail the last few slats. 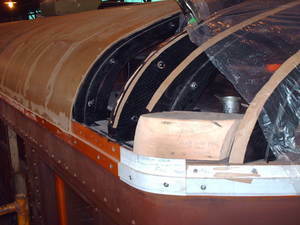 Therefore, most car builders utilized a wooden corner block to fill and retain the proper curvature of the roof lines. 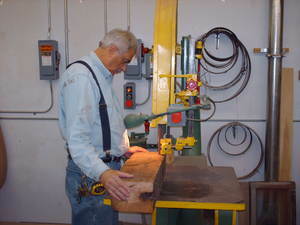 In the left picture below, Jeff is using the band saw to cut a large triangular block of wood before beginning the process of shaping the precise corner contour. The picture on the right, shows a previously cut sample block placed in the opposite corner to demonstrate placement. 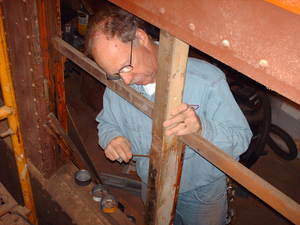 Norm Krentel has begun the process of dismantling the side window tracks. He has already removed the sashes and is shown below examining what needs to be replaced and what can be reused. Soon the newly rebuilt windows will be installed. More on this exciting process in a future report. 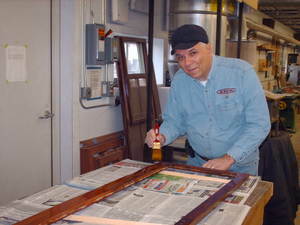 Ray Schmid is shown below applying a gloss finish to the upper sash window frames. In future weeks the pressed glass will be installed and the completed sashes inserted into the window openings. The exterior pressed glass upper sashes were painted white while the car was used as a cabin in Michigan prior to arriving at IRM in the 1970s. The tedious method to remove all the old dried paint, from the numerous tiny crevices in the ornate glass pattern, will begin next week. In between other activity, work on the trucks continues and new lettering continues to be applied to the hopper car. Victor Humphreys was in an uncomfortable position as he has worked his way under the car, here removing years of dirt and crud from the truck bolsters. By the end of the day the bolsters on both trucks had been cleaned and primed. Why you ask? We try not to ignore the hard parts and these are quite visible through the open framing on the ends of this car. Car builders often applied lettering to blow their own horns, and Pullman was no exception when these cars were built. The Great northern was a classy outfit and stenciled a record of when the car received grease and lubrication. The "Y" indicates this work was done in Superior, Wisconsin. Rules required application of an IDT stencil. As the fall leaves turn, so it was time to turn the car, end for end. This presents the unlettered side for more work in its location. And presented another rare opportunity for a photo. This right hand side now has all lettering completed except for the 'medallion' graphics. The B end also has all its lettering. On Sunday I did not grab any more images but work continued with a second coat on some of the applied lettering, more lettering applied to the A end, and the left hand side. I have been carrying around rolls of transfer patterns and stencils. Now, several of them have been used as needed and are complete on the car. So I gratefully now have a pile of 'DONE WORK' sheets. Work continues and good progress is being made on this project. Mike Stauber drew the short straw and was cleaning the last set of wheels that are now ready to go to the wheel shop. Frank Sirinek was also involved in this job, but was not recorded in this image. With the wheelsets cleaned up, Frank and Mike quickly moved on to the cleaning and priming, painting of the truck parts, now disassembled, from the second truck.